This is a second post related to the new Marvel et al (2015) paper. The first post dealing with the substantive content is here. What with #AGU15 going on, and a little bit of overlap in content with Shindell (2014), NASA wasn’t particularly keen to put out a press release for the paper, but we did get a ‘web special‘ put out on Friday Dec 18th, the last day of AGU and a few days after the paper appeared online. I’ve been involved with many similar releases for papers and it is always a struggle to concisely say why a paper is interesting while not overselling it or being too technical (which is why only a small fraction of papers get press releases at all). As we’ve previously remarked about other people’s press releases (eg. Stainforth et al or Willerslev et al), properly calibrating the aspect of a release that will get picked up by the media can be tricky, and so it proved in this case. This was followed by a credulous Investors Business Daily editorial using the Express and Mail articles as examples of a supposedly fearless UK media reporting on what the US media would not! Safe to say, that was not what was being aimed for. The obvious error is that they thought it was news that aerosol emissions have partially cancelled out some of the warming one would expect with greenhouse gas emissions. Now if this was the 1980s they might have had a point, but the fact that aerosols are an important climate forcing, have a net cooling effect on climate and, in part, arise from the same industrial activities that produce greenhouse gases, has been part of mainstream science for 30 years. As bad as that was, WUWT went one better. Apparently, not only is there a cancellation between aerosols and greenhouse gases, it is perfect(!) and that is why there hasn’t been any climate change(!). This is of course much stupider and relies on a complete lack of reading comprehension combined with a predisposition to think that the bloggers at WUWT are much smarter than everyone else. That they end up demonstrating the opposite is an appropriate karma. This is of course true and well-known – at least to people paying attention. But this is where we went wrong – we assumed a basic level of knowledge that was roughly equivalent to the summary for policy makers from the last IPCC report e.g. Fig. SPM5. While this would be reasonable for most beat journalists, it isn’t true for even science journalists who don’t cover this area, and certainly isn’t true for most news desk staffers. So whenever one talks about aerosols, one needs to put a caveat noting that greenhouse gases also come from fossil fuels and are the dominant effect. (As an aside, even the NY Times sometimes gets confused about aerosols). But is there something more going on here? Despite some neat things about this paper (IMO), and how well it fits into a story about how science really works (again, IMO), it did not get picked up by any of the more specialised journalists (ATTP did write a pretty sensible blog post though). Such is life – it obviously did not sufficiently hit any of the ‘news pegs’ journalists use to successfully pitch stories to editors. Both these responses (nonsense from the Express/Mail/WUWT, and nothing from the specialist media) confirm a well-known trope about the media in general: The Express covered it because they (incorrectly) saw it as going against the mainstream, while perhaps the specialist press didn’t cover it because they (correctly) didn’t. Just as ‘man bites dog’ is news, the opposite is not. We can sometimes get a more nuanced view of science in the media though. A narrative of a scientific establishment thrown into chaos mild confusion by outlier results that leads a band of plucky computer modellers to take up a lot of supercomputer time to investigate and who then come up with a perfectly reasonable explanation that reinforces the consensus, can occasionally get written about. It would be a story that tries to explain how science actually works, as opposed to trying to get people excited about some new result (not that there’s anything wrong with that). Some journalists and magazines do a good job on stories like this, but for every Nautilus reader, there are thousands of people reading nonsense from the tabloids. Science journalism is actually getting better over time; there are more voices and deeper coverage with the increasingly diverse number of sources available now, But whenever you see stories like this one in the Express, it reminds us that, outside of the specialist bubble, progress can be slow. Shades of Rasool and Schneider. I’m constantly amazed at how supposedly honorable people can make such decisions. They used a tried-and-true style of misrepresentation: they gave almost-technically-correct-but-massively-misleading stuff up front, and then sorta explained things somewhat truthfully down below where most folks have already stopped reading. This certainly is NOT “innocent mistakes” or “differences of opinion”. Whoever wrote the first article (I was too busy throwing up to finish reading it or start the others) obviously KNEW the truth and deliberately buried it in plain sight. The TRUTH is that aerosols simply mask a not-changing-much specific amount of warming. They mask maybe 0.5-1 degrees of warming but do NOT slow the rate of warming a whit. In fact, they represent a heat-debt. When we wean off fossils, the aerosol bill will come due. Marvel et al. is really nice work that I’ve been looking forward to since hearing about the Schloss Ringberg conference. While nothing excuses lazy journalism, though, it has to be taken for granted when writing press releases, and I don’t think the NASA web special was a model of clarity — unlike the paper itself, your other blog post, or for that matter ATTP’s brief post. It’s not so much a matter of calibrating language as of structure. I was once taught that press releases should be written like ice-cream cones, with a cherry on top and then a juicy scoop, tapering down to the boring technicalities. In this case, you had to read six paragraphs down to get the message people would care about and even argue heatedly about, which could have sparked headings like “Global Warming From CO2 Likely Lowballed”. Instead, the web special opened with “Estimates of future global temperatures based on recent observations must account for the differing characteristics of each important driver of recent climate change”, which sounds a bit ho-hum, if not, well, duh? The whole second paragraph was taken up with definitions, and so on. The heading, “Examination of Earth’s Recent History Key to Predicting Global Temperatures”, didn’t seem to be on point at all. “…it is always a struggle to concisely say why a paper is interesting while not overselling it or being too technical…” Very well observed. Ditto, paragraph 2. I appreciated the release very much and was glad to have it. Disinformers saw “fossil fuels” and “cooling” together in the same sentence, and they popped like bovine methane. They would not have read the next two sentences, or cared to comprehend the whole paragraph. You clarify it, they’ll blur it on purpose. It’s the method. And it’s the full extent of their capacity. But this does point out the need for educating about aerosols, both to further understanding of climate science and to protect human health, as the case may be. I appreciated the topical December 7 image in the release, especially because I was looking at how the BBC World Service “More or Less” trivialized and obscured a good recent paper by Rohde and others on the health effects of pollution (notably around Beijing)–notably from particulate matter of less than 2.5microns, etc. They also obfuscated probabalistic statements about flooding events. It’s a dilemma no doubt whether to try to do more with the release, which suits people like me–or to do less, to minimize potential handles for disinformers to grab. The abstract is brief and clear on what the paper is about, and the release linked that, plus some supplementary materials. Patrick #5 — Good point about the picture, which matters; I’ve also been told that the reading most people take away from a newspaper story is the heading and the picture caption. The caption did a very good job using the current-interest story in the picture to make the study’s point about the unequal geographical impact of aerosols, or so I thought. CM #6 — Copy. Press release team, please copy. Thanks for your informed perception. I subscribe to all of your remarks. On top of everything–pun intended–I can now characterize what the BBC World Service has been doing, thanks to remarks by CM at #4: It’s the cherry-on-the-hash fallacy. So NASA GISS press release team: don’t pull back. The good news is the world wants press releases, and you have the credibility. Comments from the experimenters are a good thing. An informal edge is o.k. The post in describing the nonsense from the Express/Daily Rail and also ‘scientific chaos/mild confusion solved by plucky researchers’ as being newsworthy perhaps misses the idea that newspapers & TV channels can be institutionally in denial. The BBC’s Roger Harrabin has ‘facebooked’ on this in recent days Are the BBC climate change deniers? as well as featuring on a Radio 4 complains programme on the same subject (linked on Facebook and 5 mins from 15:30) back in December. A TV journo is a bit different to a print journo but Harrabin is pointing to the small amount of time available to put a TV story across, perhaps 110 words. But the journalist is not in control of what the editor allows to be put on air and his words may be edited down to fit the space, by the journo or by the editor, and probably in a rush. Folk like Harrabin at the BBC are properly signed up to AGW but reluctant to bombard the audience with AGW at every turn. “My previous resistance to the inevitable climate mention on every flood news story remains,” he says. But beyond that, the editors & presenters at the BBC do show signs of being less ‘sighed-up’ and the message, while not overtly denialist, does not prevent a denier taking a denialist message from the coverage. That, of course, is wrong. But when there are folk involved in the process that do not see denial as a problem as well as folk who are more concerned with the entertainment factors than the denialist problem, an institutionally denialist outcome should be no surprise. Newspapers are more word-hungry than TV but otherwise the same applies. I would also suggest with the Express & the Daily Rail (& other right-wing papers) that they are likely to see a bit of down-right denialism as good for business. Such is their readership. late to comment but here goes…as a biologist working on salmon issues in the Pacific Northwest I cannot emphasize enough that when trying to communicate complex issues to the Public, points have to be easily understood and presented using terms/examples they understand etc. In reading Real Climate and climate change type articles I am always amazed how poorly this field communicates info to the Public. 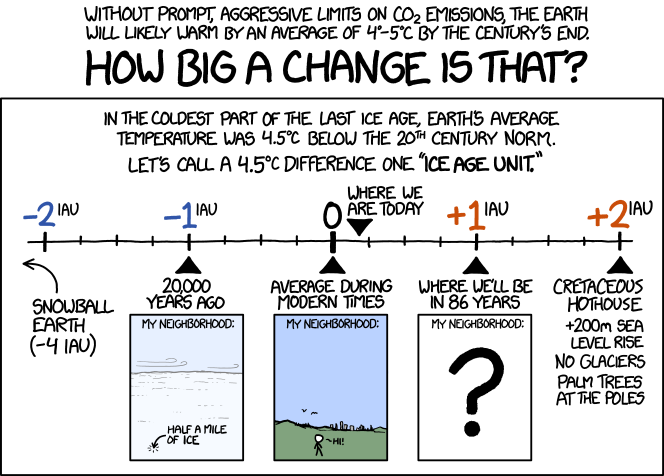 My pet peeve is where the expected change in temperature is almost always presented in degrees C and not F. I would guess that 80 percent of the US population could not define C, or convert it to F. The same knowledge level applies to anything dealing with the metric system. Secondly, when talking to the Press you need to talk like Bill Nye the Science Guy not Albert Einstein. In my experience you can never assume that what you believe to be common knowledge is actually that. The Press and Public have short memories and are not involved in the issue on a day to day basis. Yes, at one time they may have known about aerosols…but that may have been two years ago and they moved on to other topics. This one of the major reasons that businesses etc provide Press releases that clearly describe salient take home points and also, if they are well done, provide info on what the report etc doesnt say. The Press generally spends little time questioning these releases and lots of time simply repeats whats stated. As scientists we generally write our papers recognizing what the scientific critiques/weaknesses may be and trying to address these in the paper. The same effort should be given to thinking about how vested interests will use the information presented in the paper. Responsible reporters would contact GISS to make sure they understand things. There is contact info in the press release. Did the Express and Mail reporters do that? Did any other reporters? @KM #9: Indeed: Communication is difficult. It starts with understanding your public. I have difficulties understanding degrees F. In my part of the world (not US) 95%(?) is not able to convert F to C without some kind of conversion tool. General comment: Thanks for the combination of a technical post (part 1) and a separate communication post (part2). I like that! I engaged the Daily Mail over their misreporting of the Cryosat2 paper in July 2015 (documented by Jim Hunt here). During my communication with the Mail, I suggested that (since they had gone so badly wrong with their calculation) they contact the authors for clarification. Their response back contained phrases like “UCL researchers say …”. So I forwarded it to Rachel Tilling (lead author) and asked her “did you say these things ?” Her answer was unequivocal; the UCL team that published the paper had not been contacted by the Mail, and they (UCL team) did not and would never have said the things that the Mail (in their private email to me) claimed they did. Quite who the “UCL researchers” the Mail did talk to (a Classics PhD in the post room, perhaps … :-) ) were – who knows. The whole idea that the Mail may be “responsible reporters” seems laughable; they appear to have an agenda and will print anything they can find or “interpret” that supports it. The herd or tribal instinct of humans is being magnified by modern communications. One complexity is that people can instantly become members of many tribes via modern communications. If one understands that news organizations are a tribe then one can understand that selecting to work for one and then being selected requires one to abide by the tribes rules. Among the most important rules in ‘news’ organizations is to always demonstrate neutrality. In order to appear neutral one must give equal credence to all or more typically both sides of an argument or debate. It is probable that most every working writer for major print organizations and writers of copy for news readers know that AGW is a fact. That has nothing however to do with their job as journalists and reporters. The tribe requires neutrality. Gavin: “The obvious error is that they thought it was news that aerosol emissions have partially cancelled out some of the warming one would expect with greenhouse gas emissions. Now if this was the 1980s they might have had a point, but the fact that aerosols are an important climate forcing, have a net cooling effect on climate and, in part, arise from the same industrial activities that produce greenhouse gases, has been part of mainstream science for 30 years.” Isn’t 30 yrs ago in the 80’s? 1985-86? Gavin’s description of the timeline is consistent with the history there. That’s a link into Spencer Weart’s frequently updated online History of Global Warming — also found on every RC page in the right hand sidebar under Science Links, where it’s abbreviated cryptically as AIP:Discovery of Glob. Warm. The big government(s) at the time were still considering whether a preemptive nuclear first strike might be a good strategy (the idea that World War III could be won in a few days or a week and without a lot of collateral damage) — or not. Aerosols were arguably a concern and still very much news as the issue become mainstream science. Dudes, they don’t call it the Daily Fail for nothing. You say that Nic Lewis is confused. I am also confused. In fact, I think that anyone who says that they are not confused by Marvel et al is just failing to understand the situation. Completely independently from Nic Lewis, I set up a non-parametric convolution model of GISS-E2-R. This uses the step-forcing data from the published CO2 instantaneous quadrupling experiment to define the unit-step forcing responses for temperature and net flux. The temperature and net flux responses for any arbitrary forcing series can then be forward modeled by convolution of the forcing data with the unit impulse response or by superposition of the incremental forcing values with the unit step-response. Analytically, the integrals yield an identical result. Numerically, they give 3 sf accuracy with a TS of 6 months. First test was to see whether GISS-E2-R conforms to a linear system, since this is one of the important assumptions made in Marvel et al. Using the concentration vs forcing data from Hansen 2005, and Hansen’s value of 9.27 for Fi for 4xCO2, I derived (with high order accuracy, since it is not log-linear) the forcing vs time profile for the 1% p.a. experiment, and then used this to predict the temperature and net flux evolution of the 1% p.a. experiment. The temperature and net flux predictions match almost perfectly with the published data, lending support for the view that GISS-E2-R conforms to a linear system. The TCR predicted by the emulation model is 1.376 deg K vs a published TCR of 1.4. I then predicted the 20th century historical run using the Fi(iRF) values from Miller, as used in Marvel et al. Without any efficacy corrections (i.e. Weighted efficacy = 1.0) this yields temperature and net flux predictions for the 20th Century historic run which correspond very closely with the published values. The only clearly evident correction required is to the volcanic efficacy where the GCM response is slightly lower than the emulation model. Overall this would lend strong support for the view that, using Hansen’s forcing data (Fi basis), very little is required in terms of total weighted efficacy correction to the historic mix of forcings. Miller stated that the GISS-E2-R CO2 forcings were almost identical to those from GISS-E. These are the forcings I have used in the above analysis. On the other hand, Marvel et al uses a value of Fi for 2xCO2 which is almost 10% lower than Hansen’s value. Since my system is linear, the use of the lower Fi value would rescale my results pro-rata, but would still not justify the massive adjustment to TCR implied in Marvel et al. It would be truly helpful if we could have a clear statement from GISS on what the Fi, Fa and ERF forcings really are in GISS-E2-R over a range of CO2 concentrations – as per Hansen 2005. It is impossible to reconcile Miller’s statements with the values used in Marvel et al. Only with these data is there any chance of testing the Marvel et al conclusions. Even with the values cited in Marvel, I cannot reproduce her results. So, yes, I am confused. 13 Phil and everybody else: There is no point in trying to correct a provoker. Punching the tarbaby just gets you more stuck in the tar. You can do your best to word your paper carefully, but in the end your only recourse is to not communicate with such people. They are purely looking for a way to cause trouble, emotional trouble if possible. provoker: A person who provokes; a troublemaker English Wiktionary. 21 patrick: 283,796 views and 3,764 So 280032 were dislikes or unimpressed? Good? NO. “Provoker” should be listed in the psychiatrists’ diagnostic manual. If you have to deal with a provoker you will not enjoy it. Provokers are walking social disasters. It’s a particular calling in the same way any mental illness is a particular calling. #22 Edward Greisch: > So 280032 were dislikes or unimpressed? That’s a provocation and a distraction. A perfect example, thank you. It’s a cherry pick too. See YouTube for the current numbers. #24 Polly: I appreciate your comment. Many people feel the same way and so do I. But I want to say that the tabloid shlock may be closer than it seems. There was a hearing on climate change run by a subcommittee [on science] of the U.S. senate that was stuffed with tabloid shlock. It was full of shlock by plan. –For example, to take just one. Not everyone may know The Daily Mail and The Express. If I had never been given a heads-up on particular publications here on this blog, I might have wasted more energy than necessary over how reactive to be. (Though I continue to struggle with closeted fears of de-evolution.) So I think this post is good. 1) What is the instantaneous forcing value associated with a doubling of CO2? Miller implies 4.52 as per Hansen. Marvel et al states that it is 4.1. 2) What is the ERF associated with a doubling of CO2? Marvel implies a value of 4.1. Is this correct? 3) What is the relationship between CO2 concentration change and forcing? From Miller (ex Hansen) the forcing climbs above a log-linear relationship with concentration. From your 2014 paper, the opposite is true for adjusted forcing values. I would be grateful if you could release these data while we wait on your sensitivities. > Science journalism is actually getting better over time. Hear, hear. Particularly climate science journalism, I would say.